I first saw Canary in the Coalmine when it was just Jessica and Sandy. They were performing in the back room of a local store during an Art Walk event. They've come a long way since then. Now complete with a full lineup, they perform all over the city in venues ranging from restaurants, like MOJO no.4, to full concert venues such as the famous Freebird Live. This particular show took place at the Museum of Contemporary Art (MOCA) in downtown Jacksonville, FL. The show was amazing, although a little difficult to shoot since there was a pillar front and center of the "stage". The lighting wasn't bad and stayed consistent, which was a welcome change compared to other concerts I've shot. It was neat seeing a show put on in the atrium of the MOCA and I hope they will put on other shows soon. 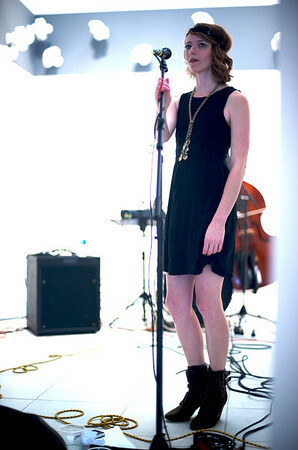 Canary In The Coalmine performed 2 sets at the Museum Of Contemporary Art (MOCA) in Jacksonville for August's Art Walk. Canary In The Coalmine performed a fantastic set at the Museum of Contemporary Art (MOCA) in Jacksonville, FL, for August's Art Walk.